But after these past 10 years or so, has my respect changed? After all, we all have people to whom we can think back, who had a profound affect on us, were just what we needed for the time, but are now somewhat embarrassing to us. Now that we're all grown up and educated about things, we look at them differently and we see that they weren't quite the super-stars we thought they were... in fact, now we can be highly critical of what once seemed to make so much sense. So I had to think about it... Now that I've got a theology degree under my belt, now that I'm a Princeton Seminarian, now that Karl Barth qualifies as devotional reading to me (clarification: this is not to say that Barth is 'easy reading' by any stretch; it's just to say that what once seemed so densely academic has now become accessible to me in a way that I can find it inspiring), and now that I'm supposedly more educated than the rest of Bell's audience, is Rob Bell such a figure to me? Has my respect worn off? "Reverence humming in me. I love that phrase. It speaks to the experiences we've all had - moments and tastes and glimpses when we've found ourselves deeply aware of the something more of life, the something else, the sense that all of this might just mean something, that it may not be an accident, that it has profound resonance and that it matters in ways that are very real and very hard to explain" (10). Before actually saying anything about this God who is with us, for us, and ahead of us; in the second chapter -"Open"- Rob spends significant space (probably too much, in my opinion) talking about science, quantum physics, and the complexity of what we think we know and how we think we know it, essentially leading us to a posture of 'openness' about life and especially about God. His point is that if you think that all there is is all there is, you're neglecting the fact that about 96% of of the universe is totally unknown to us, so you should keep an open mind. The third chapter, "Both" talks about the relationship of conviction and humility. Rob Criticizes both those who are all too certain in their claims about God and those who are so lost in ambiguity that they can't say anything about God at all. He wants us to see humility and conviction as dance partners, doing away with the extreme forms of both. All this leads into actual discussion about what we're talking about when we talk about God... for Rob Bell God is with us. That is to say that God is not distant and far off. God is not disconnected from our situation, but God is in it, involved with it, present here and now - with us. God is not indifferent to our situation, but is at the depths of it, filling it with spiritual significance. Again he appeals to the "intuitive awareness..." (116). 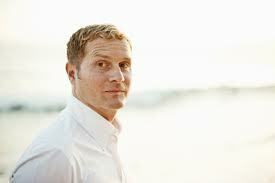 For Rob Bell, God is for us too. "God, according to Jesus, is for us because God loves us" (128). Rob has a Christocentrism running throughout his theology... that is, it's all about Jesus! "Jesus... shows us what God is like" (131-132). God is for us, not just when we've got it all together, but precisely when we don't. Whatever moralism may exist, for the Christian, "...naturally flows not from trying to get on God's good side but from your realization that God has been on your side the whole time" (137). The cross, for Rob Bell, is the place where Jesus shows us that God is for us even in the deepest darkness, "God is there, sitting with us in the ashes when we shake our fists at the sky and declare that there is no God" (144). Resurrection, then, brings a new reality to bear upon the world, one which transforms and conditions everything, one in which death and despair are not final or conquering... where "this present pain and brokenness can also be turned into something new" (146). 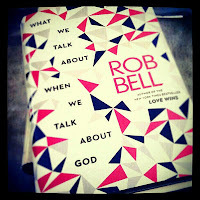 Not only is God with us and for us, but for Rob Bell, God is ahead of us. God is progressive (and not in the "liberal" sort of way... necessarily). God is not behind us, watching as we progress in knowledge and technology, hoping we might consider going back to some golden age to find God... God is ahead of us, pulling us toward a greater future. God meets us right where we are, loves us just as we are, and calls us to grow and to mature and to live into something better. This is Rob Bell's doctrine of sanctification, you might say, we are always becoming and never really arriving. As he has said elsewhere, "Jesus... loves us exactly as we are and yet loves us way too much to let us stay that way." What We Talk About When We Talk About God is for any for whom the concept of God has been disappointing, for any convinced that they're too smart to believe in an invisible man somewhere out there but can't shake the nagging feeling that there's something beneath the surface, and it's also for any who are just in need of some hope. To return to my original conversation, I think it's fair to say that my perspective on Rob Bell has changed in some ways as I've become more and more theologically trained. I can hear when he's quoting Paul Tillich (he totally does on p. 15), I can see some of his other influences, and I can criticize some parts of his argument which I may have at one time been completely uncritical. But some things have not changed. I am still inspired by his project and the depth of his insight. Rob Bell is not a scholar or an academic theologian. But I am still convinced that he's brilliant - much smarter than me! And the more I learn, the more my respect for him grows. 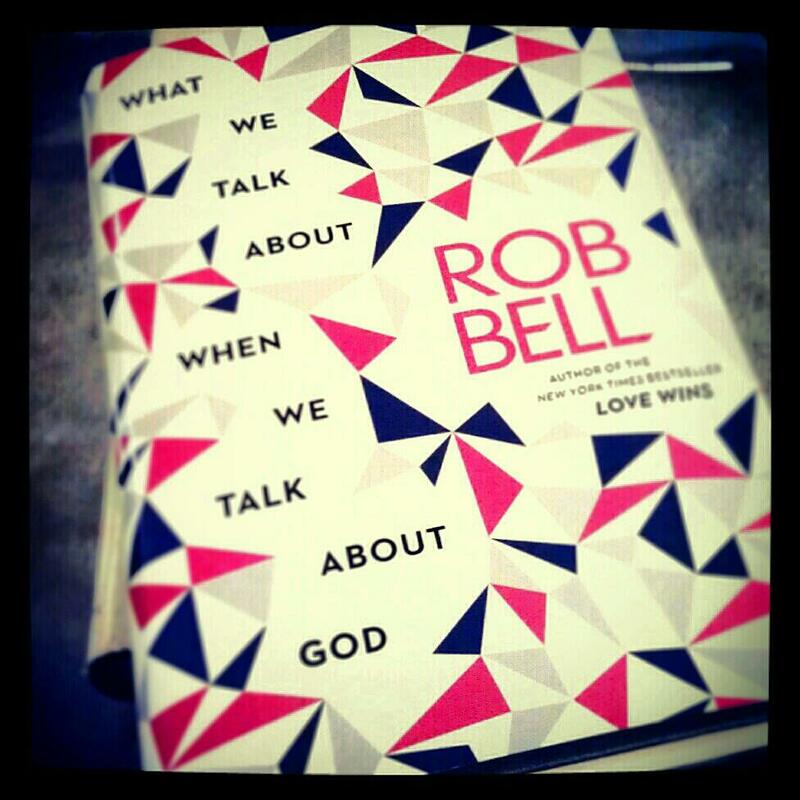 Rob Bell is not one of those guys who was good at the time, but is no longer relevant to me now that I'm grown up. I still learn from him and I'm still inspired by him. When my friend asked me if I respect Rob Bell, after thinking for a second, I responded, "I think Rob Bell might be the single most important person to my spiritual formation (aside from people I know personally)." ...I'm satisfied with that answer. I've got to agree. Bell continues to re-awaken in me the wonder and awe and mystery of God that is so often lacking in more traditional Christian circles. His honesty, humility and obvious love for life and Jesus have been an inspiration to me.